You will appreciate all the floor space provided by five slide outs in this Montana fifth wheel every where you travel. With dual slide outs in the living area and two slides in the kitchen, plus a decorative ceiling treatment in between, you will find this area spacious and inviting. You may choose from theater seats with power recliners and a hide-a-bed sofa to watch the HDTV with fireplace below, or work at the executive desk. You can store lots of food in the 18 cu. 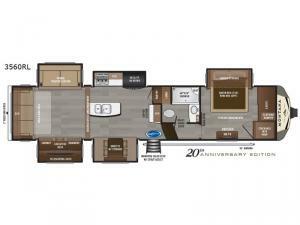 ft. RV refrigerator and pantry as you make a cup of Joe at the coffee station. The kitchen island allows you to serve food as well as clean dishes. Just imagine getting ready for outdoor adventure after getting cleaned up in the full bathroom. You will also find plenty of storage throughout for your clothing, dishes and such. Take a look to find even more enhancements from the 20th anniversary edition features! When packing for your next trip in a Keystone Montana luxury fifth wheel you will appreciate the enormous drop frame pass-through storage compartment, the MORyde "Step Above" entry steps with strut assist, and the LED light package including "super-bright" taillights with backup marker and off-door scare light. The Montana 20th Anniversary Edition adds exclusive features such as the Key TV satellite prep, LED accent lighting, Tru-fit slide construction, and Easy Sweep resilient flooring. You will love the in-floor heating ducts, which allow for more airflow to be distributed evenly for optimal comfort. the LED motion sensor light in the pass-through compartment and convenience center, plus the Four Season Living package allowing you to travel whenever you like. It's time to find the luxury fifth wheel you can enjoy for years to come, choose a Montana by Keystone today!